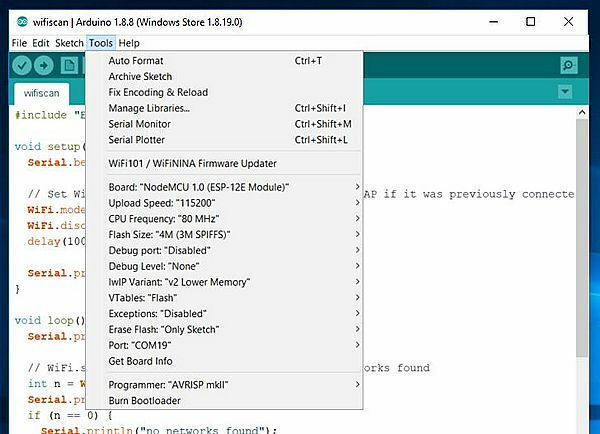 The easy way to use the ESP8266 is with the Arduino IDE and this ESP8266 Arduino tutorial shows you how to install drivers into the Arduino IDE to program the ESP8266. It then shows you an example sketch using wifi. The Lolin nodeMCU V3 breakout board is an ESP-12E style ESP8266 breakout board which makes it very easy to use an ESP8266 device - you just plug it into a micro USB connector and its ready. The board includes its own 3V3 power supply regulator, a reset button, a Flash button and a USB-to-serial chip (CH340G on mine). You can just plug it into a USB port (micro USB connector) and start using it. When you follow the instructions below, you can program the Lolin NodeMCU as if it were any other Arduino device. 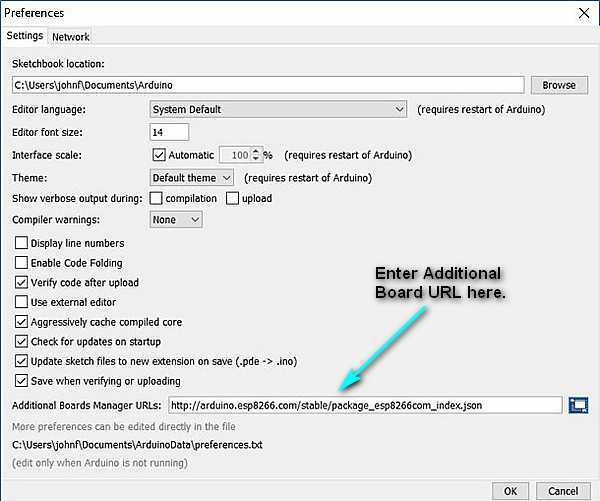 This is convenient since it uses the same familiar Arduino IDE programming environment. Note: Just so you don't get confused: Lolin is a manufacturer name - I originally thought it meant some kind of extended range radio (similar to a Lora device). Warning: The Lolin nodeMCU V3 comes with the LUA scripting language flashed into it. Using the ESP8266 Arduino IDE as described below will loose that scripting language (overwritten). To get LUA back you would need to re-flash the firmware - just so you know. (LUA Scripting is interactive and quick - but you need to learn another language). This is a LUA interface which is an interactive script system - you can type commands directly at the prompt to get the ESP8266 to perform. However the rest of this page shows you how to use the Arduino programming environment to program the board in C/C++ as you would with any other Arduino board. If you continue past this point and Flash the Arduino sketch then the LUA environment will be overwritten. If you want to use LUA again you will need to re-flash the firmware. 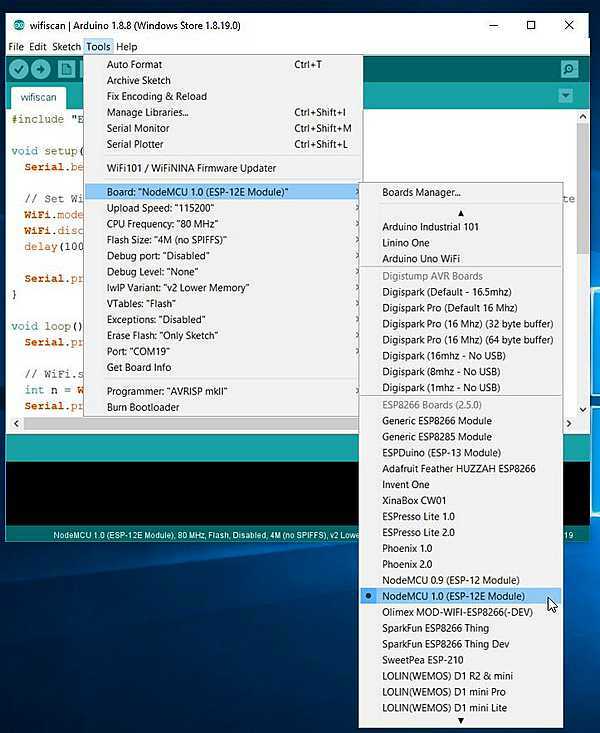 The first step in setting up the ESP8266 Arduino IDE is to plug in the NODEMCU and check the Windows device Manager for an entry in the Ports section. If you don't see the NodeMCU showing up as shown below then you will need to install drivers. The other possibility is that the NodeMCU is using too much power - I found it would not work from a powered hub but only from direct connection to the PC USB port. It needs 400mA! Note: You can add an external power source to the Vin connection on the board with voltage >5V. Also connect ground labelled 'G' to complete the circuit. Warning: The AMS1117 absolute maximum input voltage is 15V - do not go above this i.e. do not supply a voltage to 'Vin' above 15V. This will allow NODEMCU boards to appear in the main menu alongside boards such as the Arduino Uno. 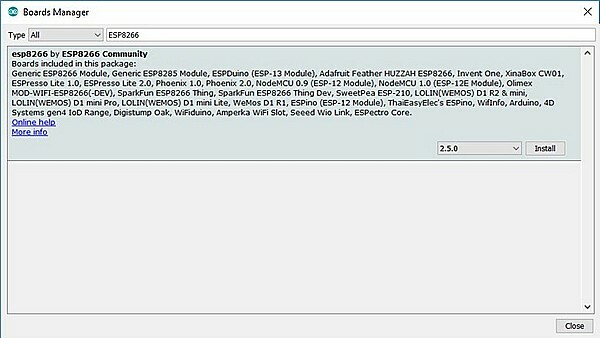 Search for and install the "esp8266 by ESP8266 community" Entry. Now select the nodeMCU 1.0 (ESP-12E Module) entry - this is the base type for nodeMCU. nodeMCU is actually the firmware running on an ESP8266 ESP-12E. Board "nodeMCU 1.0 (ESP-12E Module)"
Flash Size "1M (3M SPIFFS)"
Warning: I originally set the Flash Size to 4M no SPIFF - only the WiFi scanner example below worked - The SPIFFS is a virtual file system that allows programs to occupy a space separate to the wifi operational part - its like having a virtual SD card so make sure you use the setting above (or at least allow some SPIFFS room). Use the ESP8266 Arduino IDE to load the following sketch - just copy to white area of the IED and hit the upload button. This shows you a quick example of the ESP8266 Arudino wifi capability. This example is from github. Here's the typical output from the sketch using the serial monitor. End of ESP8266 Arduino IDE tutorial showing how to flash an esp8266 with an Arduino .